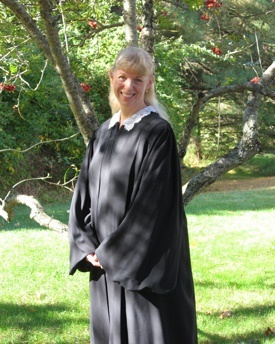 I've been a New Hampshire Justice of the Peace since 2008, after more than 10 years in public relations, where I honed my writing, speaking, and event-planning skills. Since that time, I've performed ore than 400 wedding ceremonies. Being a JP is a natural choice for me, not only because of my background, but because I have the great satisfaction of connecting with couples and helping to create and support the intimate space between two people who are promising to spend the rest of their lives together. 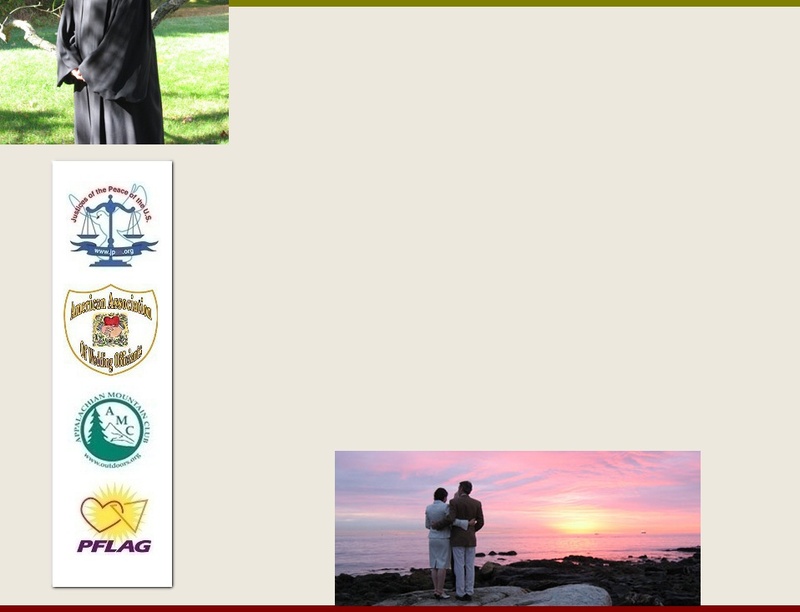 Professionally, I'm a member of the American Association of Wedding Officiants and JPUS (Justices of the Peace of the US), the nation's largest organization for and about Justices of the Peace. I'm also proud to be part of AMC (the Appalachian Mountain Club) and PFLAG (Parents and Friends of Lesbians and Gays). I love meeting couples of all ages and backgrounds and helping them plan for and celebrate their weddings; whether they're straight, gay, or lesbian; and regardless of whether the wedding will be for two people who have never been married before, or for those who are confidently beginning again. I'm also happy to officiate affirmations and vow renewals for couples who wish to celebrate their weddings and anniversaries with family members and friends! My husband Richard accompanies me to all ceremonies, and he's always on hand to assist so that things run smoothly. He normally takes a few pictures, and we'll share a few with you via email after your wedding, with our compliments. Richard is also a Granite State Ambassador, and out-of-state couples often find his knowledge of New Hampshire is very helpful when planning destination weddings for two....or more! Your ceremony is the heart of your wedding day. I look forward to hearing about your plans and working with the two of you to create a wedding ceremony that celebrates your commitment to life's journey, together!